1. See our cool events! It’s easy, we promise. First things first: join the Meetup. That’ll ensure you get our e-mails about upcoming, awesome events that are designed so you (1) have a lot of fun; (2) meet new, great, left-leaning people; and (3) learn about and contribute to local and regional organizations doing rockin’ social justice work. Second, just to be sure you’re in loop, consider following us on Le Twittre (twitter) or the FaceBooks. 2. Come to events. Meet people. You’re on Meetup. You’re on Twitter and Facebook. What’s next? Show up! We don’t bite, unless somehow that becomes essential to supporting the wider progressive movement in the case of a zombie apocalypse. No, really, just RSVP on Meetup! That’s it. Then show up. You just became a tractivist! What’s that? You’ve been to some events and have a great idea for either a brand new one OR want to get us involved with an existing organization’s event we don’t know about? Well . . .
We don’t only create our own. Folks like you who know of awesome local activities or are part of cool organizations suggest them! We’ll need two point people (find a buddy) to write a compelling e-mail following our guidelines (*needs link) and maybe wear a (free) Traction t-shirt at the event, collect people when they show up, and make sure they have an enjoyable and meaningful time. That’s it. That’s all it takes to create a Traction event. So if you know of cool progressive things to do in the area that connect folks with inspiring and exciting people and experiences, we want to hear from you! 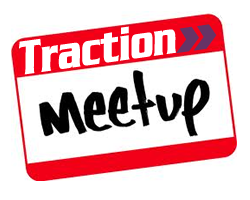 E-mail us at the Traction Meetup page for the organizing team with your ideas. Like the occasional event planning, and think we’re doing something important? Got a few hours a month to keep this thing going? Then why don’t you . . .
4. Join the leadership team! Why? Because we could use the help! :) Not only that, it’s satisfying work, if you’re into it. Help us spread the word about great progressive work being done in the Triangle. Connect progressives new to the area or just new to the scene with approachable, fun “entry” events so they can not only meet like-minded folks and expand their social network but also connect with work being done in the area for the progressive movement. Direct organization support is essential, but so is investment in increasing the base of supporters. That’s what we’re about. Come help! Let us know you’re interested by saying so here. Once again, we promise that whole “no biting” thing above applies.